Christians have been taking pilgrimage to Santiago de Compostela for 1200 years. El Camino de Santiago means “the Way of St. James” and is a walking pilgrimage across northern Spain to the Tomb and Cathedral of St. James. For Spring Term (May) 2019, Chaplain Jeremiah Gibbs will lead 18 students and 3 faculty on a 21 day journey from Indianapolis to Santiago de Compostela. In Spain, we will visit Leon, Astorga, Ponferada, Compostela, and Madrid as well as walking through about 100 towns and villages. Lots of interaction with Spanish villagers and some of the 250,000 annual pilgrims from around the world are highlights of the journey. If you want to get a sense for what Camino de Santiago is like, this movie is one of the best for an honest look at the heart of the pilgrimage. The trailer is a good glimpse into Camino life. • Spiritual pilgrimage is a journey to a holy place. • Spiritual pilgrimage calls for a life transformation. • Spiritual pilgrimage is a difficult journey. • Spiritual pilgrimage requires disconnecting from routine. 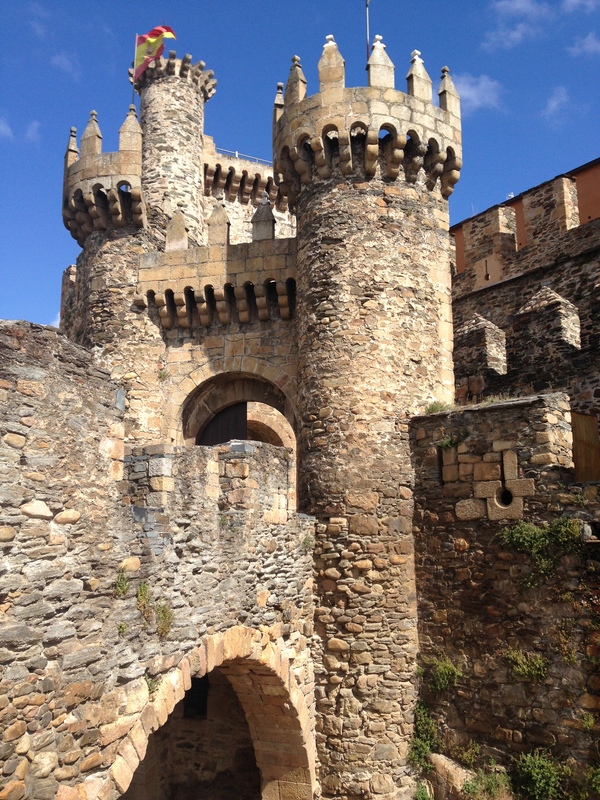 The 12th Century Knights of the Templar castle in Ponferrada. Eighteen UIndy students and 3 faculty/staff will make pilgrimage. 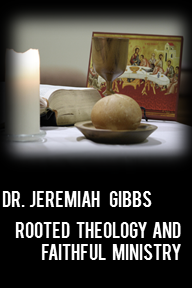 Chaplain Jeremiah Gibbs will be trip leader and spiritual director on the journey. One faculty leader will be a physical therapist to help assess and treat walking injuries. Some students are likely to be those involved with campus ministries, making the journey for religious and spiritual reasons. The trip will also count as a Spanish culture elective for Spanish majors and minors. 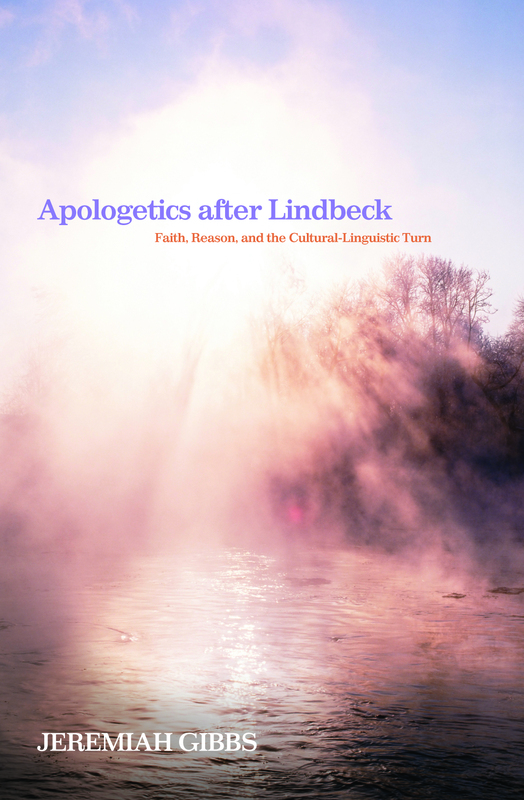 Non-religious persons are welcome on the trip and will be given reading and writing options that invite them into a transformational experience without requiring religious commitment. The trip will be 21 days (approximately May 11-June 1, 2019) through northern Spain. This will include about one full day each in Leon, Astorga, Santiago de Compostela, and Madrid. We will walk 10-14 miles per day for 15 days. Accommodations will include some hotels and mostly albergues, special Spanish hostels that are only for pilgrims. These are normally clean and safe, but are tight coed living quarters. The journey is designed to cause pilgrims to explore their religious and personal commitments as they walk long miles with other pilgrims, engage a culture and people very different from their own, and experience ancient and holy places. Students that take seriously the religious practice of pilgrimage will enter a focused and disciplined spirit of prayer and communion with God. The program cost of the trip will be between $2100-2600. This will include meals, travel, and accommodations for the entire journey as well as the required course texts. Required equipment will cost another $350-$500. Competitive grant funding is available from the university and successful grants could cover $500-$800 of the costs. Passport will cost $135 for those that do not have one. A nonrefundable deposit of $250 will be due when decisions are made about the students selected (likely before Thanksgiving holiday). Another payment of $750 will be due on January 16. The full balance of the costs of the trip will be due by April 15. Contact Jeremiah at gibbsj (at) uindy.edu with questions. Informational meetings will be held in the chapel on Thursday, October 4 at 10:00 pm and Friday, October 5 at 11:00 am. Regularly updated information is found here on this page. When you are ready to apply for the pilgrimage, you can do so online here. YOU MUST BE LOGGED INTO YOUR UINDY GOOGLE ACCOUNT TO APPLY. Priority consideration for applicants received by November 1, 2018. After November 1, any available space on the trip will be filled first come, first served. Day 1 (May 11) – Leave Indianapolis International airport with a connecting flight at a US airport. Day 2 (May 12)- Arrive in Madrid in the early morning. Travel via train to Leon by early afternoon. Spend the afternoon settling in and seeing the city. Day 3 (May 13)- Spend much of the day seeing the city of Leon, especially Leon’s beautiful mid-13th century Gothic cathedral. Near the end of the day, we will travel via train to Astorga. Day 4 (May 14)- See the remains of the original Roman city of Astorga and attend Mass in Astorga’s 15th century Cathedral of Santa Maria. Day 5 (May 15)- Begin walking the Camino de Santiago. The first day is a beautiful and difficult one, walking about 20 km and increasing by 350 m in elevation to Rabanal del Camino, a mountainside village where pilgrims often triple the population of this small village of 65 on any given night (walking 20 km). Day 6 (May 16)- Just 5 km into this very steep walk, pilgrims arrive at Cruz de Ferro (“Iron Cross”). For hundreds of years, pilgrims have unloaded their “burdens” by symbolically leaving a rock at the foot of this old metal cross. Many believe miracles happen at this mountain peak. After leaving their burdens on the mountain, pilgrims begin a spectacular descent down the mountain (17 km). Day 7 (May 17)- This entire day’s walk is down a steep and beautiful decline. When we arrive in Ponferrada late morning, we will visit the 13th century castle of the Knights of Templar (pictured above). The castle is in spectacular shape. The towns 15th century basilica is right next to the castle (16 km). Day 8 (May 18)- Though we walk nearly 23 km this day, it is one of the flattest days on the Camino. One part of the trail walks directly through a Spanish vineyard and ending the day in Villafranca. Those that pass through the town’s “Door of Pardon” were considered to have received the forgiveness that was promised to those that finished the pilgrimage. Some pilgrims simply couldn’t finish the steep climb to O’Cebreiro after the weariness of their journey! Day 9 (May 19)- Walking 19 km will bring us right to the foot of the steepest climb, resting in Ruitelán before climbing in the morning. Day 10 (May 20)- This day begins with the steepest climb to the highest mountain that the group will experience, nearly 500 m elevation in the first 8 km. On top of the mountain is O’Cebreiro, an ancient town where tradition says that the “Holy Grail” was once hidden (15 km, very difficult incline). Day 11 (May 21)- Yesterday’s steep climb is met with today’s equally steep descent. We are now into the heart of Galicia, and the major language is Galician, though many speak Spanish as well. You will notice major shifts in culture and architecture. After our longest walk of our Camino (25 km), we will end the day in Samos, home of a 6th century monastery that is still in operation. Day 12 (May 22)- Today’s walk is just 15 km, much of it downhill. We end the day in the full service town of Sarria. Sarria is the beginning point for pilgrims to receive their compostella, so the number of pilgrims increases significantly these last 100km. Day 13 (May 23)- The quiet walk out of Sarria is about 17 km among large shade trees. The small hamlets have gotten both more frequent and smaller now, some being home to only 10 residents. Day 14 (May 24)- After spending the evening in the tiny hamlet of Mercadoiro, we walked down into the valley of Portomarín and then another climb up to village of Ventas de Narón (19 km). The village’s population is just 20! Day 15 (May 25)- This day will be mostly downhill, with some up and down through several river valleys. We will walk about 17 km before arriving at another tiny hamlet, Casanova. Day 16 (May 26)- Mid-morning we will reach the town of Melide, a full service town of about 5000 people. After having a “second breakfast” here, we will continue down the mountain to Ribadiso da Baixo (21 km). Day 17 (May 27)- Today is a long walk of about 19 km, but not a difficult one as we make our way through 15 small hamlets before stopping in Santa Irene. 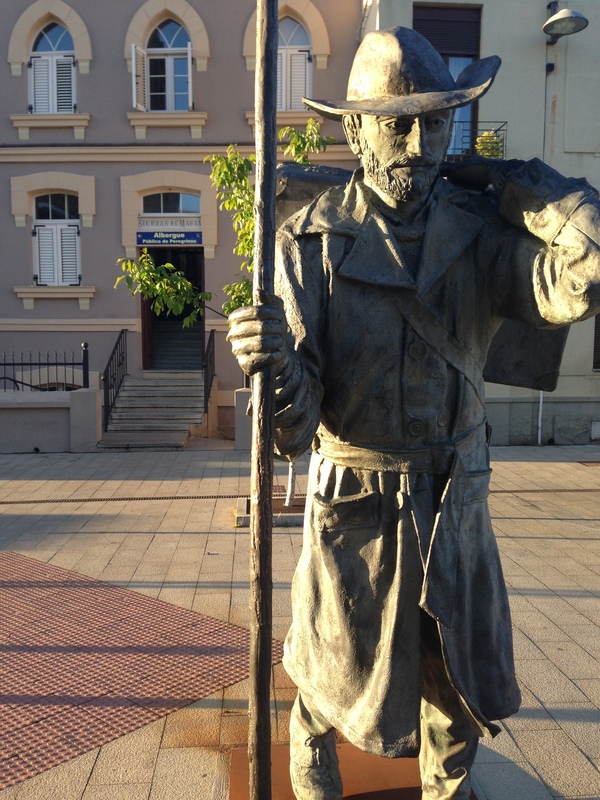 Day 18 (May 28)- The last 18 km to Monte de Gozo will be busy with lots of pilgrims as they near Santiago. This is a great time to hear about the stories of each pilgrims Camino as they prepare for it to end. Most will wish that it wasn’t over. Everyone will want to share stories. 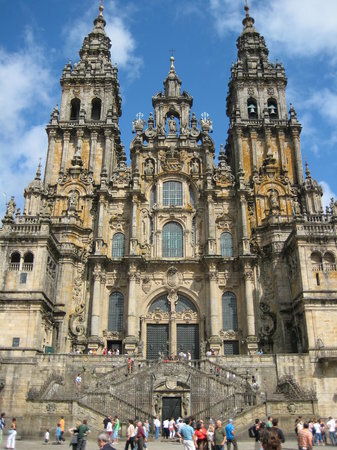 Day 19 (May 29)- Just 5 km separates the pilgrim from Santiago de Compostela. After walking into town, we will check into our beautiful hotel that is just 30 m or so from the Cathedral. This day will include Mass at the Cathedral, visiting the tomb of St. James, receiving our “compostela,” and exploring this beautiful and lively university town. Day 20 (May 30)- After spending the morning in Santiago, we will take a train from Santiago to Madrid. This train takes a quite different route, allowing sites of a different region of Spain. After checking into our hotel, there should be time to see some of the active night life of Madrid with street performers and musicians playing the plazas until very late. Day 21 (May 31)- You will have many options on this day in Madrid that may include a visit to the Royal Palace, Madrid’s Romanesque Cathedral (and Mass), bull fights at Plaza de Toro, or flamenco dancing. Shopping, dining, and street performers will abound. Day 22 (June 1)- Fly from Madrid and arrive late the same day in Indianapolis. I would love to hear more about this trip! Eileen, I will add you to my mailing list! Pay attention to the calling out meeting dates and the application deadline on this page. They are coming up soon! This trip sounds interesting and I would like to get more information about it, it sounds like I would love it! Awesome! I’ll add you to my email list too. Check out the call out meeting times and application deadline. I would love to be added to the list. I’ve recently added a Spanish minor and with my religious background I believe I would really enjoy this! You will love it! I will add you to the list.